Castle Rock Lawyer Marc Patoile’s clients have again selected him in 2016 as one of the best attorneys in a variety of categories, including Communications Ability, Responsiveness, Quality of Service, and Value of Money. 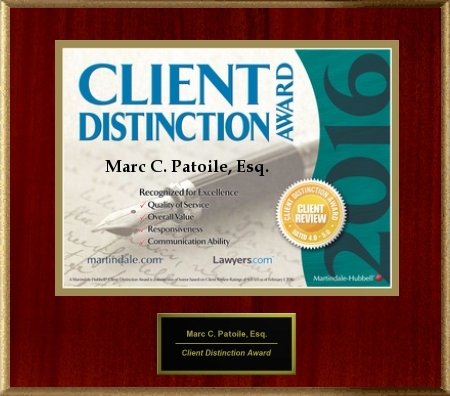 Martindale-Hubbell awarded him their 2016 Client Distinction Award. Through Martindale-Hubbell’s® Client Review Ratings, Castle Rock Lawyer Marc Patoile has been found to be exceptional in all the professional qualities that help client’s evaluate a lawyer’s ability and recognition among peers and judges.